BlueStacks is an Android emulator which allows you to use Android apps on your Windows or Mac computer. Last year the Windows 10 Beta received more than 5 million downloads prompting the Mac OS X beta to be released a few weeks ago and, more recently, a new version which can be used for Windows Surface Pro. While you can use this emulator to some degree of success on an ordinary computer, it works better if it is installed on a touchscreen device, particularly with the games. To this end, the Surface Pro seems to be one of the better devices to use BlueStacks on – it’s proved to be a popular tablet, with the first round of 128GB models selling out. 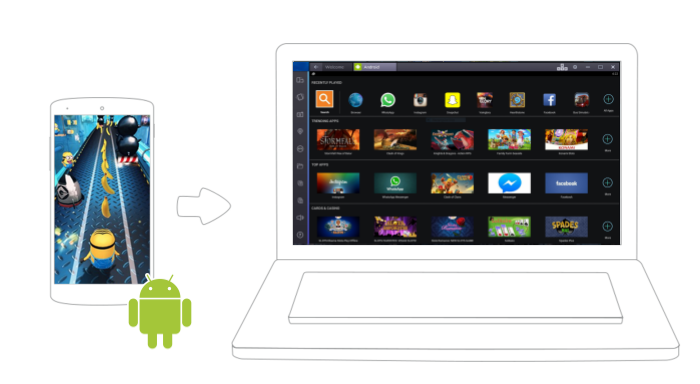 Now, with BlueStacks you can enjoy all 750,000 apps from Android on Microsoft’s latest offering. BlueStacks is relatively young, barely 2 years old, but in that short time span, it has received millions of downloads and the new Beta version is just going to see that number increase even further. The company has also signed a deal with a range of different PC OEM’s to allow BlueStacks to be preloaded on more than 100 million PC’s throughout 2013, meaning that the Android user base will increase significantly and Android developers will not have to port separate apps for both platforms. Give BlueStacks a try now , it’s free of charge, takes only a few minutes to install and opens up a whole new world for those not already using Android. Download all 3 versions[ here ].